Get access to highly targeted and fresh email data lists. We offer a complete solution from email data selection, email creative design and email delivery - "The Reactiv Way"
With over 4.3 million fully opted in email addresses in our MIDAS consumer database you will benefit from instant results whether you have a new product, raising public awareness or have a sales promotion. Reactiv can design your email creative and deliver your broadcast using our elite email platforms. Get advanced reporting with open rates, click throughs, links clicked on and sales. Need help in taking the next step? Talk to one of our email data list specialists today. Need to send your email? Reactiv's dedicated design team can build your html email to have the right look and feel for your business. Unlike most of our competitors, we offer bespoke design at fixed prices with revisions and changes included. 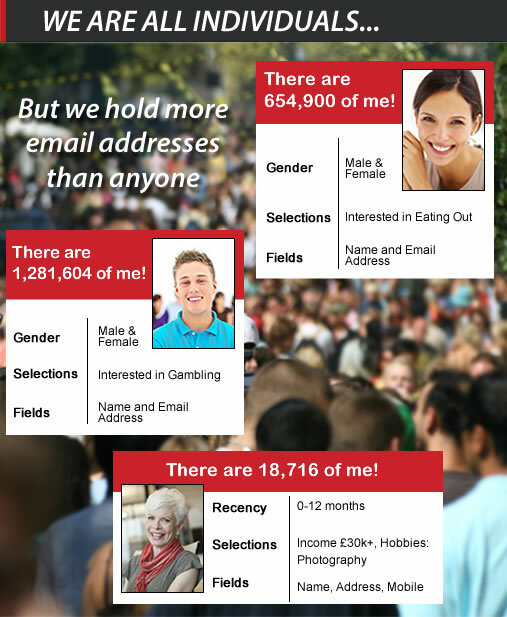 Reactiv's elite and robust email platforms can deliver your email campaign using a profiled selection our email records or your email database. You will receive full reporting of opens, clicks, unsubscribes and which links were clicked on. Useful information when analysing the performance of your campaign.